It began with a small group of expatriate Newfoundlanders and Labradorians who wanted to make a connection with other like-minded folks. 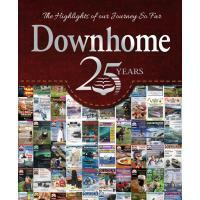 Now, with this special edition, we are looking back at the highlights of 25 years of incredible people, amazing adventures, cherished photos, poetry, humour and all those elements that have made Downhome magazine popular at home and around the world. This book is dedicated to all those who've contributed to the magazine over the years - from the early days of The Downhomer "Serving Newfoundlanders Everywhere" to Downhome " Life is Better." The Mindful Turtle - Teaching coping skills to kids. Recommended for "kids" ages 5 to 99! - Florence Strang, B.A; B.Ed; M.Ed.